Chippawa Battlefield ParkThe Battle of Chippawa, fought on July 5th 1814, was the opening engagement of the Niagara campaign of 1814, the longest and bloodiest military operation of the War of 1812. The battle took place on the fields of Samuel Street's farm near the banks of the Niagara River. It began when a British, Canadian and aboriginal force of about 2,000 men, under Major-General Phineas Riall, attacked an invading American army of about 3,500 men under Major-General Jacob Brown. The fighting started early in the morning and lasted until nearly six o'clock in the evening. When it was over, the British were forced to withdraw and the Americans won the day. Three weeks later, however, the invaders were turned back at the bloody battle of Lundy's Lane, fought on 25 July, 1814. The Battle of Chippawa took the lives of about 200 American, British, Canadian and Native warriors allied to both sides, most of whom are thought to be buried at the battle site. It marked the first time the American regulars faced British regulars in a stand-up military action fought in the open and many historians cite Chippawa as the birthplace of the modern American army. Due to a shortage of cloth, the American force wore grey uniforms instead of the usual blue. To this day, tradition says that West Point cadets wear grey uniforms to honour those who fought in this battle. The Niagara Parks Commission acquired the site of the Battle of Chippawa in 1995 and has preserved 121 hectares (300 acres) of this pristine battlefield, the last remaining site from the War of 1812. A self-guided walking tour helps retrace the events of the battle. A memorial service is held on July 5th each year to commemorate the fallen of all the nations involved in this pivotal battle. 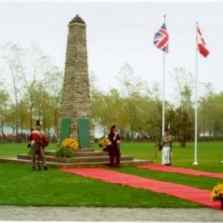 A focal point of the Battlefield is the memorial cairn, dedicated to the regiments and First Nations warriors who fought in the battle and commemorating the peace that has prevailed between Canada and the United States since that time. The monument is constructed of dolomite limestone donated by Fort Niagara (Youngstown, New York), another key site in the War of 1812. Niagara Parks is preparing to celebrate the War of 1812 Bi-Centennial. Plans are being made for special events beginning in 2012 - visit the official Visit 1812 website for updates on this important milestone shared by Canada and the United States of America - 200 Years of Peace.